"I feel really mean today. I could make all of Rome's lovers cry." At the age of 21, a production assistant and protégé to the political artist Pier Paolo Pasolini was charged with a rare duty: to direct a feature film. The young man was surprised and shaken, but maintained a façade of confidence that defied the doubts of his elder crew. Bernardo Bertolucci, now a household name of Italian cinema, has since created such notable works as The Conformist and the recent The Dreamers. Based on a treatment by Pasolini, La Commare secca (The Grim Reaper) shares some common attributes with the controversial director's work; Bertoluuci himself hoped to solidify his mentor's name in a unique, homage-laden genre: the Pasolinian film. The plot is quite formal. A prostitute is found dead on the banks of the Tiber, and the police round up a group of suspects who were in the area. A young thief, a soldier, a pimp, a drifter, two young lovers, and other witnesses are interrogated by on off-screen detective. This voice of justice bookends small vignettes that depict the activities of each individual during the course of a day, leading up to the time of the crime. Each is a suspect, intersecting with one another at various points along their respective journeys. When a rain shower erupts, we cut to the victim's home. The prostitute, not so young and fetching anymore, rises from an afternoon nap and prepares for the evening's shadows, unaware of the danger that awaits. This familiar plot certainly takes a page from Kurosawa's masterwork Rashomon (which Bertolucci hadn't seen at the time of production), but it manages to maintain a sense of originality. Bertolucci seems less interested in an exploration of the subjectivity of truth and reality, and more intrigued with the details of daily life in Italy's slums. Sharing a common thread with the work of Pasolini, Bertolucci has returned to the "sub-proletariat" of the borgate, where the poorest of the poor resided in squalor. Most of the characters in this protagonist-free film are from such areas, making loose political statements in alignment with Pasolini's Marxist ideology. This is by no means an overtly political film, but the elements of class struggle are certainly a backdrop. We follow the exploits of several characters: a soldier flirts freely with an endless chain of young girls in the streets (a rather humorous sequence); two teenagers soak in the sun and the amore of midday Rome, accompanied by their girlfriends; a drifter wanders through the parks and paths, looking to occupy himself after getting off work; a gang of thieves looks for their next mark in a local lovers' hideaway. These bits amount to a revealing look at a spectrum of Italian life, and it's here film's the originality comes in. 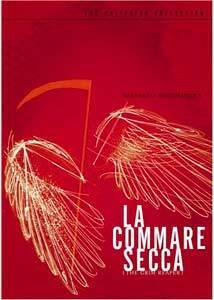 Where Kurosawa's tale revolved around different accounts of the same event, La Commare secca rarely utters a deceptive word—doing so would undermine the intended exploration of the ordinary. Granted, the script, while well structured and compelling, does not impress with its events or dialogue. What elevates the material is Bertolucci's keen directorial eye—a visually stunning debut for any young filmmaker. The camera is a character, as well, revealing geography and mood with long, lyrical, meticulously planned takes. The camera is rarely stationary, creating some dynamic shots that inject energy into otherwise mundane moments. Pasolinian frontal close-ups crop up, but this is clearly Bertolucci's realm. Fitted with a haunting score, Bertolucci's style helps make up for the lack of professional actors. Perhaps this was the best choice; real people with real lives are captured on celluloid, and the crime, though the motivation for the story, becomes secondary. Image Transfer Review: Criterion's anamorphic transfer is slightly windowboxed to maintain the 1.66:1 aspect ratio. The black-and-white imagery looks beautiful, sporting deep blacks and good detail. Just the right amount of fine grain is present, maintaining a filmic look. Audio Transfer Review: The Italian mono audio is free of hiss, and features clear dialogue, most of which was clearly dubbed in post. The musical score is well represented. Extras Review: The only sizable extra is a revealing, newly-recorded interview with Bernardo Bertolucci (16m:35s). The director recalls working with Pasolini on Accattone, how he came about writing and directing La Commare secca, the film's premiere at the 1962 Venice Film Festival, and more. Some of the more interesting portions involve the problems posed by Bertolucci's youth. Not only was he directing at 21, but he had just published a book of poems. He didn't feel particularly liked at Venice; people thought he had his "fingers in too many pies." Bertolucci would not receive wide attention until his next feature, Before the Revolution. I should mention the menus. Usually, Criterion's menus are as exquisite as their cover art, but this disc proved frustrating. The menus' background color is a dark gray, and the button highlight color is black (in the form of a small bar underneath the menu option). Needless to say, it's quite difficult to see what is being selected until you hit enter. An insert with an essay by David Thompson is also included. Bertolucci's debut film is a visually mature take on Rashomon that prefers the details of daily life to the particulars of the crime. Criterion's a/v presentation is superb, but light on extras. This remains a debut worth seeing. Highly recommended.